As a photographer, I usually spend most of my time avoiding having the Sun behind me. If it is, then the camera ends up looking at the subject from the same angle as it’s being illuminated from, and this results in a very flat light with few or no shadows. 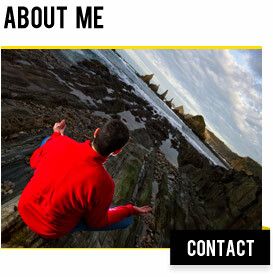 If you ever want to capture a really bland and emotionless image, then just position the Sun behind you and voila! There is however one exception to this rule - rainbows. Rainbows only ever appear directly opposite the Sun. In fact, the center of any rainbow is exactly 180 degrees to the Sun. This does however make them easy to predict, as we know exactly where they are going to appear (given the right conditions of course), so we can position ourselves suitably and simply wait. Although the light on our subject is now going to be flat, hopefully the rainbow will be vibrant enough to steal the show, and become the main focal point of the image. Let’s assume we are in the perfect position with the Sun directly behind us. 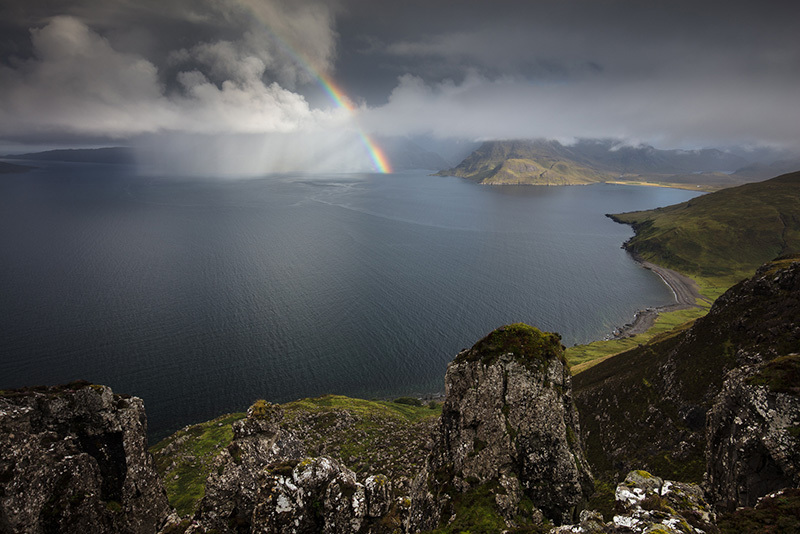 There are still a few things we need to consider to capture a vibrant and dramatic rainbow shot. The first thing which will really help bring out the colours of a rainbow is a polariser. Forget what you were told about a polariser not working when facing away from the Sun - with rainbows, that rule goes out of the window. When faced with a vibrant rainbow, looking through the viewfinder and rotating a polariser in front of the lens will have the effect of making the rainbow appear nicely saturated, or not being visible at all. Obviously you want to stop rotating the polariser when then desired effect is obtained, and this is likely to be close to maximum saturation. If using a wide angle lens, it’s good to pay attention to other areas of the image as you rotate the polariser, as you might get some unwanted results which may not notice at the time of taking the photo, as your attention will be on the rainbow. When I first posted this shot, I received cries of "If you ever needed proof that God exists, just look how he's positioned that rainbow"! The simple truth is, that I positioned myself so that the rainbow came out of the church spire. I could have positioned it to the right by moving right, or to the left by moving left. As we have just discussed, if we imagine a rainbow as being a complete circle, then the centre of this circle is always exactly 180 degrees opposite to the Sun. Therefore, if the Sun is high in the sky, as would be typical around midday, then there is no chance of getting much of a rainbow as you would only ever see the very top of it, if it is visible at all (the cut off point is when the Sun is more than 42 degrees above the horizon). The lower the Sun is in the sky, the higher the top of the rainbow will be. If we stand on level ground when the Sun is very close to the horizon, any rainbow will be a complete semi-circle, with each end hitting the ground vertically. So ideally we want to shoot rainbows close to dawn and dusk when the Sun is close to the horizon, as this will place the rainbow nice and high in the sky. If we are able to get into an elevated position to allow us to look downwards onto the landscape, then it is possible to see more than a semi-circle rainbow. Suddenly they can become 270 degrees, or even full 360 degrees if you can get high enough with rain very close to you. Often we can observe a double rainbow, and it is possible to get a triple rainbow or even a quadruple rainbow, but these are very rare. A secondary rainbow’s colours are always reversed from that of the main rainbow, with red on the inside rather than the outside of the arc. 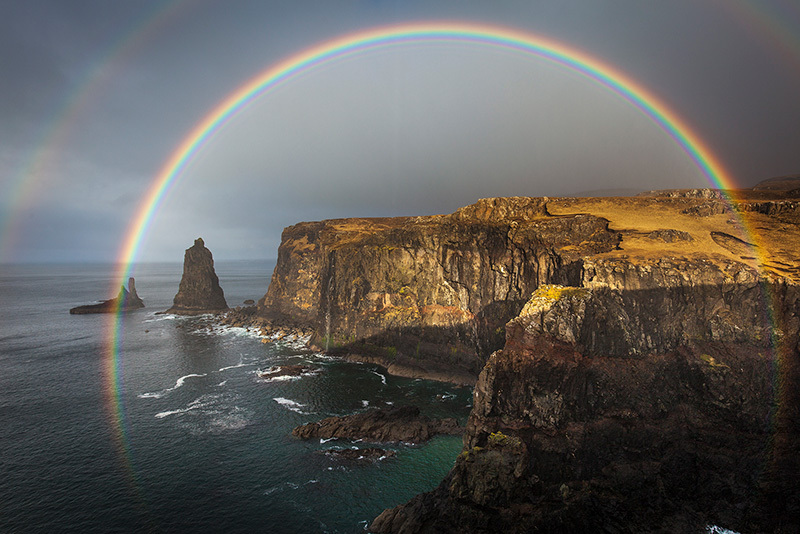 This has embarrassed a couple of well known photographers in the past who Photoshopped double rainbows into their images, with each arc being the same sequence of colours! Whoops! 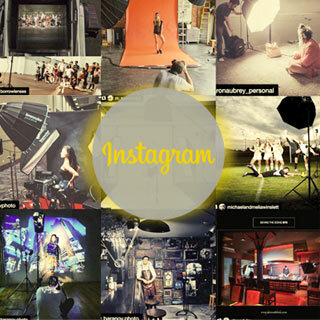 I won’t mention any names, but this kind of behaviour is why many people assume all good photos are not real anymore. 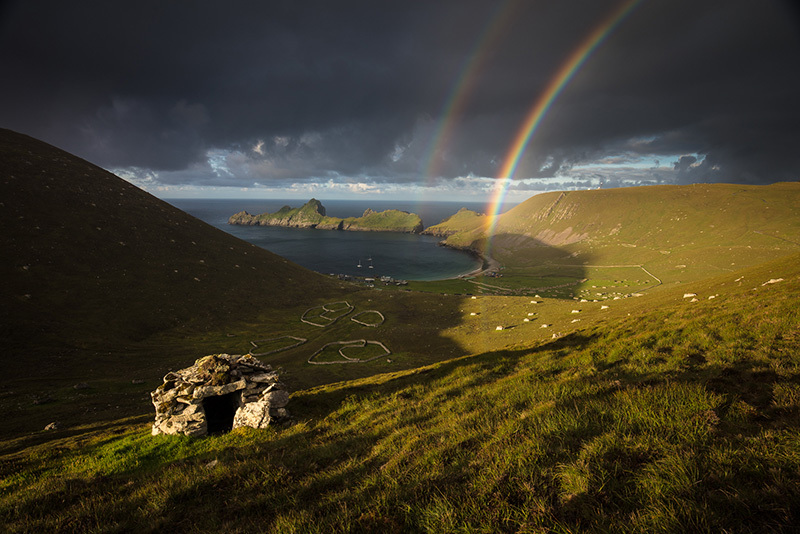 There’s even a piece of software available which will put a rainbow into any landscape image. Of course, it looks awful, and to the trained eye it is obviously fake. If the only way you can get a rainbow into your shot is to kale it, then now is the time to give up photography and maybe look at taking classes in painting or cross-stitch. Those who follow my work will know that my philosophy towards photography is to only capture what is naturally there, and I put in a lot of time and effort to achieve this. I only ever take photos - never create them. The sky outside the main rainbow will always appear darker than the sky inside the main rainbow. This is known as Alexander’s Band and is caused as light from the main rainbow is reflected back towards the Sun (which is opposite to the centre of the rainbow), so as the observer sees it, this will always be within the arc of the rainbow. The angular diameter of any rainbow is always identical, at around 84 degrees, but our eyes can deceive us depending on how far away the rain is falling. If it is further away, then obviously the rainbow is further away and our brains are fooled into thinking it must be bigger than one closer to us. 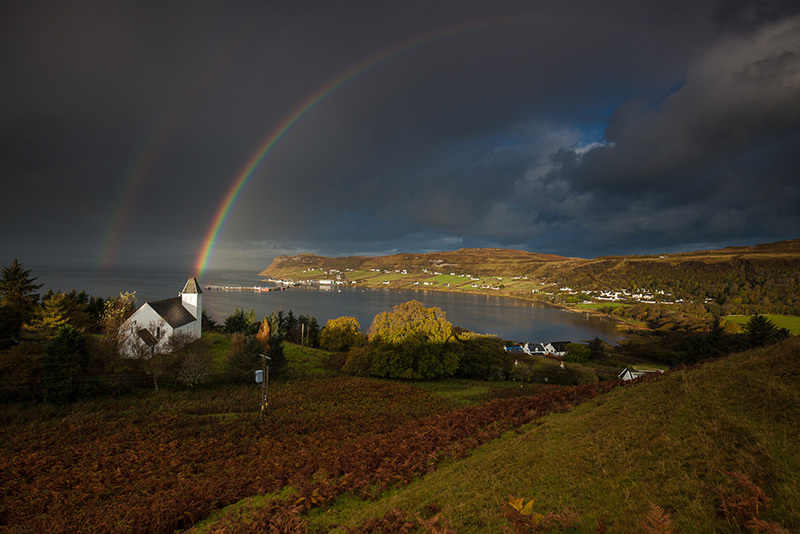 Regardless of how near or far away a rainbow is, you will need a focal length of exactly 24mm (on a full frame sensor) to include it all, but this still won’t allow space around the rainbow, so ideally you’ll need around 16-20mm. 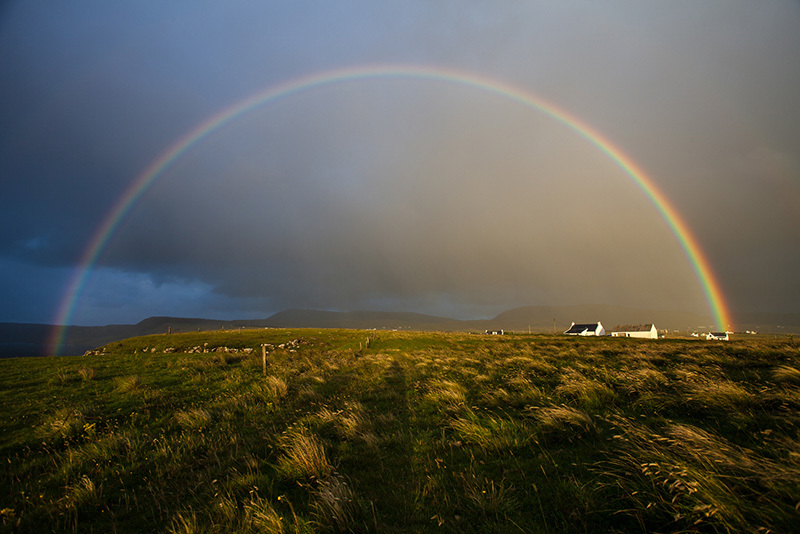 Of course, you can shoot just one end of a rainbow with a longer focal length, so it’s not all about wide angle shots. In fact, shooting only one side of a rainbow enables us to position the Sun away from being directly behind us, which increases the quality of light on the rest of the scene. Rainbows can be fleeting or long lasting. This is generally governed by the wind, as the faster the rain clouds move, the shorter lived the rainbow will be. On a calm day when clouds are not moving fast at all, a rainbow can last for a very long time. In fact, the longest ever recorded was in Sheffield (UK) in 1994. The rainbow first appeared around 9am, and lasted until 3pm. As this was in March, the Sun never got above 42 degrees in the sky, enabling the rainbow to be constantly observed above the horizon. 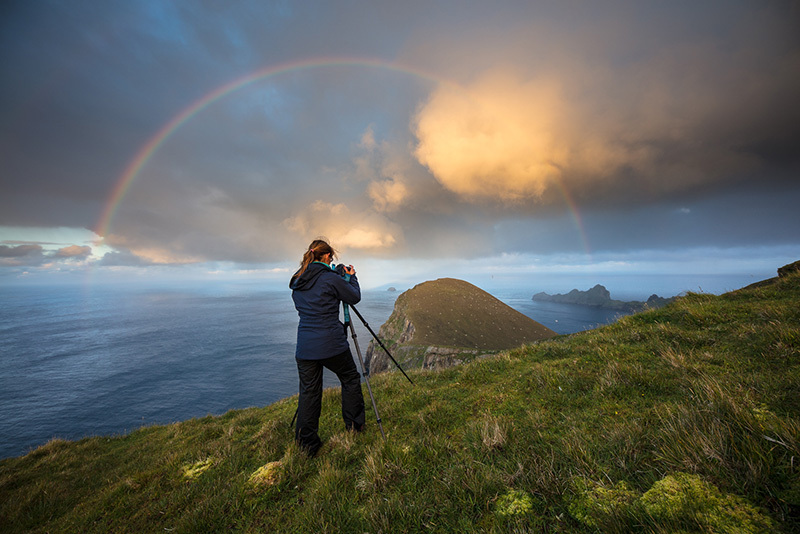 When rainbows are long lasting, it is easy to get a decent shot, as we have plenty of time to position ourselves (and therefore the rainbow) in order to get the perfect shot. When conditions are more fleeting, we need to predict where any rainbows are likely to happen and wait for the action to happen. Remember, all you need for a rainbow to appear is for the Sun to be behind you (the lower in the sky the better), and rain to be falling in front of you. Once you understand this, it’s really quite easy to predict when the perfect rainbow may appear. For example, let's assume we have found a great view of a castle and we think that getting a shot with a rainbow arcing over the top of it is going to win us worldwide recognition. All we need to do now is work out when the Sun is going to be directly behind us. This is very easy, especially with the help of websites such as The Photographer’s Emphemeris. Let’s say that the Sun is always behind us at 9am. As we have already seen, the lower the Sun is in the sky, the more of the rainbow we will observe, so this tells us that we need to shoot this during the winter time when the Sun is rising between 8am-9am. During the summer months the Sun will still be behind us at 9am (allowing for the adjustment of Daylight Saving adjustments to the clocks), but it will be too high in the sky, and any rainbow that does form probably won’t be high enough to arc over the castle. Now all we need to do is keep an eye out for a forecast which shows sunshine and showers. It’s as easy as that. Taken just a few days ago after many attempts of dismal failures. Even on this occasion I had to wait in the rain for over 2 hours before everything came good. One thing to watch out for when the Sun is very low in the sky is getting our own shadow in our shot. If shooting with a wide angle lens, then the chances are that our shadow (or the shadow of our tripod) will ruin the shot. Another mistake not to make is to assume that a rainbow on its own is a good enough subject for a decent photo. It is not. Think of a rainbow as a complement to an already strong image, rather than an image in itself (as below). Lastly, be prepared to get wet when you go chasing rainbows. It is entirely possible that the best conditions will occur when it is actually raining, so carrying an umbrella with you isn’t such a bad idea, as this will allow you to take shots whilst keeping any rain off the lens. Even so, make sure you have a few absorbent lens cloths with you, as wiping the occasional stray drop of water from your lens will be the only pastime as you wait for that illusive rainbow to appear.